The fort itself, originally earmarked for a hotel, will instead be turned into an arts and culture centre, comprising galleries, museums, shops, restaurants, which will be open to the public. The latest masterplan, submitted to the Planning Authority in November, also drops plans for mooring points in the current swimming area beneath the fort, which will be retained for public use. 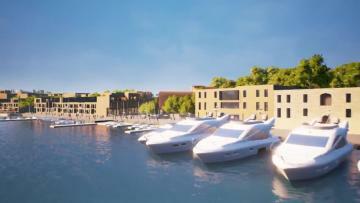 These plans are currently awaiting an Environment Impact Assessment (EIA) ahead of a decision by the PA.
A masterplan video provided by Manoel Island developers Midi. Claire Bonello, the new foundation chairwoman, said she was confident the plans would create an environment for both residents and the public to enjoy. Gżira mayor Conrad Borg Manche, who had spearheaded opposition to the project under an earlier draft of the masterplan, said the new agreement ensured the “considerate development” of Manoel Island and that the local community would remain at the forefront of any development decisions. The agreement follows a year of negotiations between Midi, the local council and environmental groups after the first draft of the masterplan was released in February 2017 to widespread criticism. This followed public protests over access to the foreshore, which was a condition in Midi’s outline development permit but was nevertheless sealed off for 16 years. Access was later restored amid sustained public pressure. eNGO Flimkien ghal Ambjent Ahjar was thrilled by the agreement, calling it a "historic first". It commended the inclusion of the fort itself - to be reserved for cultural activities and retail as opposed to the initially proposed hotel - as part of the agreement, as well as the undertaking for the retention of heights and of a green public park which twill not be commercialised or built over. "This is very positive news," said FAA spokesperson Tara Cassar. "It goes to show how constructive and sensitive dialogue with stakeholders can result in a project which can be enjoyed by all. This is a win for the community and could well be the model for future agreements for other projects. "FAA would like to thank all those who never stopped believing and supported this initiative - a special thanks goes to Kamp Emergenza Ambjent, the local community and all others who have Manoel Island at heart." * No structures or commercial activity of any type within the public park or foreshore, which must both be kept accessible to the public. * Designated public swimming zones on the north and east shores. * No hotel or residential development at Fort Manoel, which must be used for cultural and commercial purposes and be kept open to the public. * Building heights to be limited to those approved in the planning permits (currently four storeys). No height increase without the consent of the foundation. The Gżira local council has signed a guardianship agreement with Manoel Island developers Midi with the goal of guaranteeing protection and public access to the island’s heritage buildings, foreshore, and green areas. Prime Minister Joseph Muscat, who presided over the signing of the agreement on Thursday, heralded the step as a “significant milestone” for the country, and a model for the relationship between developers and the community. The agreement sees the setting-up of the non-profit Manoel Island Foundation, headed by environmentalist Claire Bonello as chairwoman, Gżira mayor Conrad Borg Manche and deputy mayor Ralph Mangion, and Midi chief executive Mark Portelli. This foundation will act as a watchdog of the commitments set out in the guardianship agreement, including the landscaping of the glacis surrounding Fort Manoel to create an 80,000 square metre public park.